WARF’s Patent No. 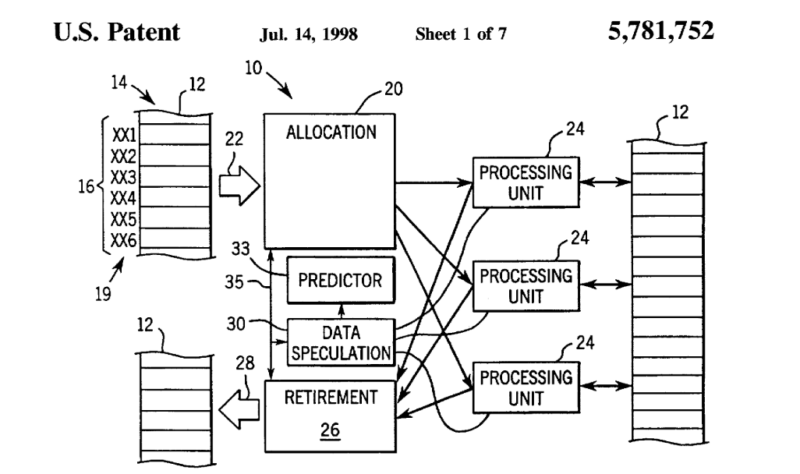 5,781,752 covers the use of prediction in parallel processing in order to increase the accuracy of processor speculation. A Wisconsin jury agreed that Apple’s A7 and A8 chips infringed and awarded $234 million in damages. On appeal, the Federal Circuit has reversed — holding that “no reasonable juror could have found infringement based on the evidence presented.” As such, the district court improperly denied Apple’s JMOL motion. Parallel processing can get through the code faster because it doesn’t require strict linear processing order. That setup, however, can lead to “ambiguous dependency” problems — where one parallel process needs input (such as a data address) from another process also running in parallel. In that setup, the processor still might “speculate” and run the instruction with the expectation that things will work-out. A “mis-speculation” leads to data errors. The issue on appeal centers on the patent claims that require a “prediction” of mis-speculation associated with a “particular” data-load (LOAD) instruction that is then used to decide whether to call the instruction. On appeal, the Federal Circuit reversed the jury verdict of infringement and instead held that the “particular” instruction is not met in Apple’s product. While the accused processors do the prediction, the problem is that the each ‘prediction’ value is typically* associated with multiple instructions — not just one particular instruction. Thus, in the appeal, the Federal Circuit effectively construed the “prediction associated with the particular [load] instruction” to require a one-to-one relationship between the prediction and the instruction rather than a one-to-many. Thus, the no infringement result. So far, this seems like a fairly typical Federal Circuit decision. associated with other load instructions.” However, neither of these statements were given to the jury. In our view, the plain meaning of “particular,” as understood by a person of ordinary skill in the art after reading the ’752 patent, requires the prediction to be associated with a single load instruction. Note here that this is the entirety of the court’s legal analysis of the claim term’s meaning. The court does not review the prosecution history, or evidence of a person having skill in the art, etc. But, instead just provides a conclusion. The result is that the jury verdict is gone. Perhaps on remand, the district court will order a new trial — and perhaps this time will go ahead and construe the term. In addition, WARF has a narrow infringement argument suggested by the fact that Apple’s products are capable of operating with the prediction value associated with a single instruction. During trial, however, WARF did not present evidence that showing that the processors actually ever worked in that manner. Thanks for reporting this, but please, for the umpteenth time, Dennis, please list the judges when you report these cases. Prost, Bryson, O’Malley. Not a surprising dereliction of duty by the panel when you consider the first two are on it, although I’m surprised O’Malley went along with this b.s., she knows better. Just reading the overview, IMHO, sounds like the handiwork of Judge Bryson. Sure enough. You know, he just figures it out, smartest man in the room, smarter than any trial expert, smarter than any jury or trial record, can just tell at a glance where prior art is enabled for 102, etc. And, of course, all swallowed up in the Markman – de novo – review of the claim construction. Obviously both sides were well represented, a proper trial record created and put to a jury. Yet, here we have it, the original criticism of the CAFC – results oriented decision making. The CAFC clerks with their undergraduate degrees in science and no experience are the new secret experts that determine patentability. Yes, but they placed well on moot court, which was judged by volunteers with law degrees. Seriously, its as if the CAFC lost all institutional knowledge of patent law the better part of a decade ago. B >>its as if the CAFC lost all institutional knowledge of patent law the better part of a decade ago. I agree. It was Obama who appointed judges that were —in general–ignorant of patent law, ignorant of science, anti-patent, and anti-science. The Google Judges are horrible. The only solution is to disband the CAFC and reform it with new judges. I think that the Google judges should get on their knees, look up, and open their mouths to replace the urinals at the CAFC courthouse. That sounds more like a hyper-particular or mono-particular instruction. Everyone knows there are degrees of particularity. In some cases, even pseudo-particularity or virtual particularity will be particular enough for predictive purposes. Distinguishing which cases are adversely affected by sub-optimal particularity is outside the scope of the present discussion, which is particular enough for all instant purposes except for those plainly excluded. Hey it’s just the Supreme Court and we all drank beer. No, don’t give him a polygraph, have him eat nachos and see if he ralphs; ask Mark Judge show us all how to play Devil’s Triangle. Lol nobody believes anything leftists say MM. Just looks like more of the same. The CAFC judges not applying the law and just making up their own private findings of fact to weaken the patent system. Note that the judges do not have a science background so how they could possibly understand this technology is beyond me. I am sure they do not. Probably have clerks that have technical backgrounds, so what we get is likely the judgement of clerks with a science education (probably BS) with no experience overriding the opinions of Ph.D.’s with many years of experience secretly through the power of a circuit court judge. Because you need a Ph.D in science (lol) to determine if an “instruction” is “particular”? Welcome to the farce, folks. So you advocate a person who probably has a BS degree with no experience to act as the “secret” experts over the people that have been designing real systems for many years. What’s the melting point of a “particular instruction”? Just, FYI, Judge Newman has a Ph.D in Chem.E., Judge Moore has an MSEE, and Judges Stoll and Chen have BSEEs. That said, JUDGES ARE NOT EXPERT WITNESSES, and when they act as such it is dangerous as they violate due process. I am aware of their backgrounds. And it is probably why the worst decisions don’t come from Newman or Moore (although Moore is another one with a poor character, but she does understand technology. In Bilski she said that invalidating information processing was the same as invaliding all EE patents. She is right.). Stoll had a terrible reputation for her character before being appointed as a judge. She was probably appointed for her willingness to agree to burn down the patent system for the appointment. Chen was virulently anti-patent before his appointment. And not even the ones with a science background are not experts. I figured you were aware as we’ve discussed this issue before: My message was written for MM. Who cares about Means, if the court (or Court) gets its desired Ends?